In the interests of absolute transparency I record all my share recommendations and produce a P&L in % terms on an ‘Inception to Date’ basis. Unlike a lot of ‘tipsters’ my trades also include a % adjustment for bid/ask and transaction costs. Here is the summary as at 31st March 2017. 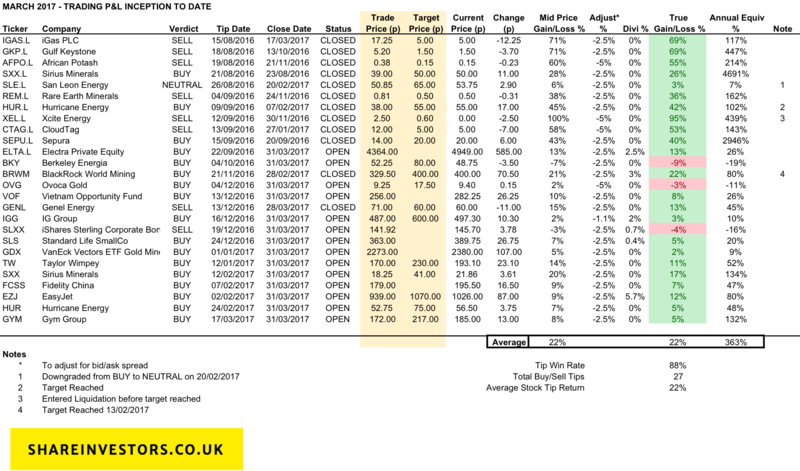 The average stock tip has delivered 22% return Inception to date, with 88% of my 27 tips in profit. On an annualised basis the average tip is 363%. Regarding Berkeley Energia (BKY), the market was spooked by a bearish broker note, the exit of BlackRock as a share holders (likely following the research note) and the lack of further financing news for the completion of the mine. My understanding is there is no huge rush to complete financing as there is plenty of money in the bank to get ‘spades in ground’. I plan to do another blog piece in April looking at BKY in more detail, but with the shares back below 50p this could be a buy, especially with the promising exploration news. Regarding Sterling Bonds; I have seen nothing to indicate that my belief of a due correction is incorrect. Previous Previous post: Gym Group Flexes Biceps to secure maiden Profits. Buy on this news? Next Next post: Barclays CEO reprimanded over treatment of whistleblower. Bonus is cut, but is this enough?